It is pretty much an unwritten rule that "gumbo" is made with your leftover turkey and carcass in Louisiana. The cookbook above was a wedding gift to Gary and I (22 years ago) and it is a small cookbook that has the recipe just about every type of gumbo you can possibly imagine. 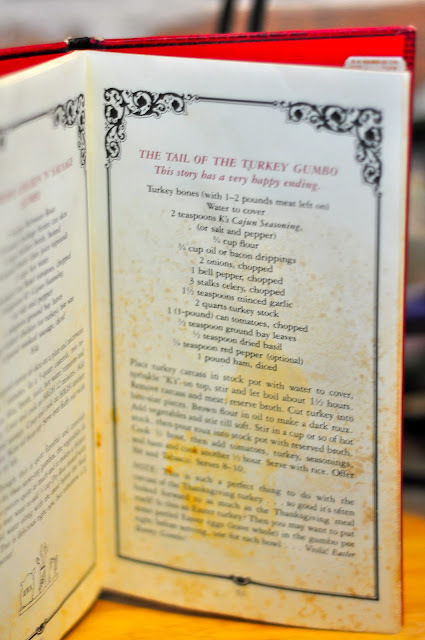 As you can see, it has gotten quite a bit of use...particularly this recipe! the bonus is the great smell you get from making roux. round of stirring and fretting! Tony Chacheres and seasonings of your choice. our case, since we are big duck hunters, whole ducks. Let the meat cool and now is the part I detest..
which is picking the meat off the bone for the gumbo. to properly cool, so I often burn my fingers. thick broth that taste devine. Now for the fun part.....mixing your vegetables into the roux! true cajuns must have file (cajun spice) sprinkled over it. use oil or bacon grease. when making turkey gumbo as it has proportions and actual measurements! Once you have made a few gumbos, you become more confident about "mixing it up"
TIP: They now make Gumbo seasoning that you can buy at most any grocery store, I do all the above and when I am letting the gumbo mixture simmer at the end, I add about 1/2 pack and find it gives my gumbo a really good flavor. You do have to look for one that doesn't have the rice in the mixture. I just started doing this and it really pushed it "over the top" and when you are in a pinch, you don't have to simmer quite as long to get a good flavor. Don't kid yourself ~ Gumbo is about a three hour process if you do it right....but it is sooo good and it freezes well too! You can make this recipe with any meat....chicken, fish, shrimp....it really doesn't matter; it is all good! When I make it, I do two huge pots and have lots for the freezer......we like to have those freezers good and full before hurricane season!!!!! For those of you that don't live in LA (that is a JOKE....but unfortunately is true and we are left powerless for days, trying to eat everything in the freezer before it goes bad!